A Cambridge lecturer says colleagues should refrain from using terms like brilliant, genius and flair, as they could alienate female students. Dr Lucy Delap, deputy director of history and policy at Cambridge, said these terms were vague and carried assumptions of gender inequality. Dr Delap said female students were often less likely to project themselves into such categories. 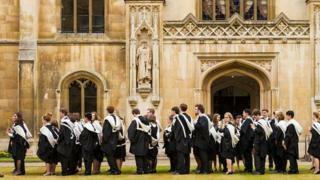 She said a "male-dominated environment" at Oxbridge must be challenged. Speaking on BBC Radio 4's Today programme, Dr Delap said: "Students who're arriving at an Oxbridge college can still find it a bit of a male-dominated environment. "If you look at just something as simple as the art on the walls of a college, they're often by men and they depict men and often they're white men as well. "We think that a more plural environment would encourage a wider range of people being able to imagine themselves as powerful figures, as success stories, as excelling in academic terms." Her comments come as the history course at Cambridge is under review. "We would very much like to see reading lists transformed so that they reflect more female historians, we would like to see more opportunities to study women's history," said Dr Delap. "We want women to be able to imagine themselves as excelling and owning that space and create an environment that empowers women to succeed. "We're rewriting the first two years of our history degree to create a wider set of paper choices, to make assessment criteria clearer, to really root out the unhelpful and very vague talk of genius, of brilliance, of flair which carry assumptions of gender inequality and also of class and ethnicity inequalities." Asked if this was about taking men out of history, Dr Delap said there was no attempt to censor male influence. "It would be impossible to teach history without men in it," she said. But critics said the approach was misplaced. Prof Alan Smithers, from Buckingham University, said: "It seems to me wrong to look at this from the point of gender - imagine the outrage if we were adjusting things for the sake of men. "It's patronising and wrong to think they have difficulty with terms such as genius." In 2015-16, 31% of women students gained firsts in history at Cambridge compared with 39% of men. A university spokeswoman said it was reviewing subjects to see how it could address variations between different groups. Dr Delap's comments come a month after a group of 14 black undergraduates at the university posed for a photograph aimed at breaking down stereotypes of the institution. The group posed for several images that were shared on social media in an attempt to encourage more black students to apply to Cambridge. In April, Oxford University announced it was putting up more portraits of women in its buildings. It said it wanted to redress the balance from the university's walls being lined with pictures of "dead white males" by adding more women and ethnic minorities.